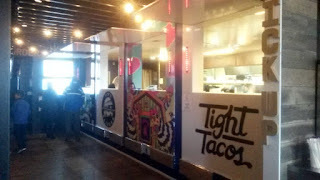 FOMO Chicken is located at Cartlab PDX (SW River Road) in Portland, Oregon. 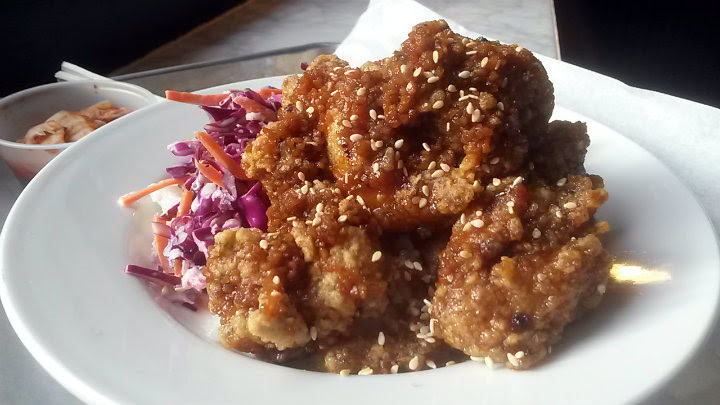 This fried chicken spot focuses on Korean (Asian) and Southern-American flavors. 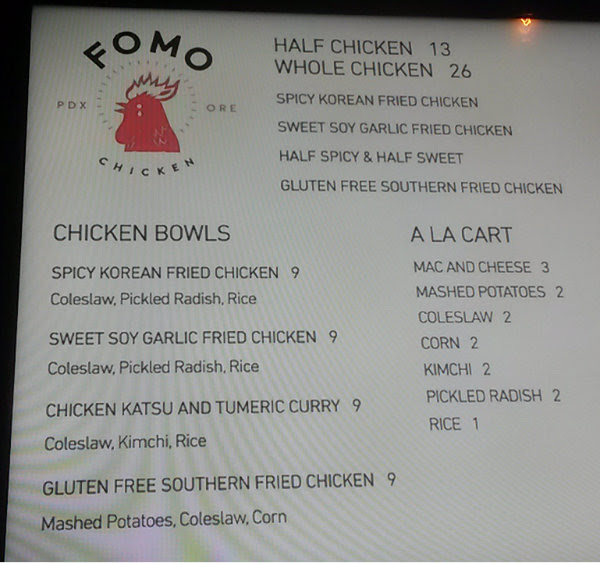 You can go with bowls featuring chicken and sides, or go for the gusto on protein with get half-chickens or whole chickens (sides separate). I came by with friends, and we split a couple of dishes. 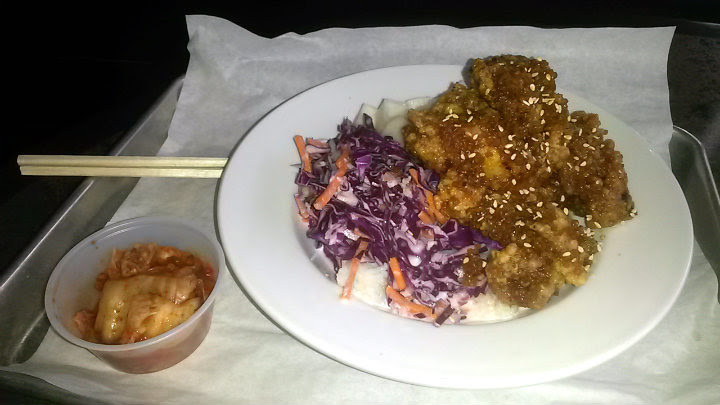 We started with the Sweet Soy Garlic Fried Chicken bowl ($9), which comes with carrot and purple cabbage coleslaw, pickled radish, and rice. 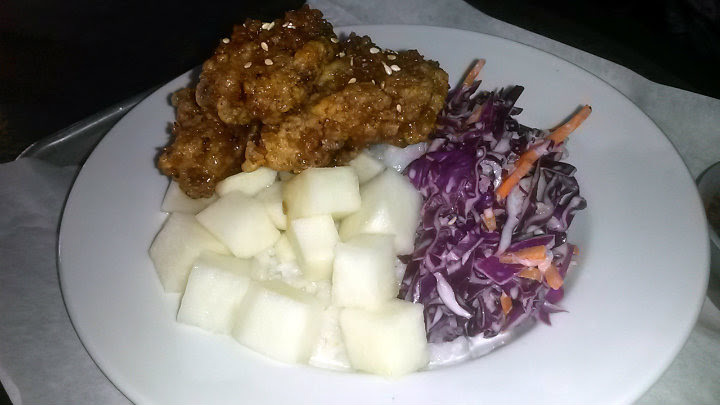 The fried chicken pieces that I had were dark meat, with spot-on flavors. No mistaking the sweet, soy, and garlic here. 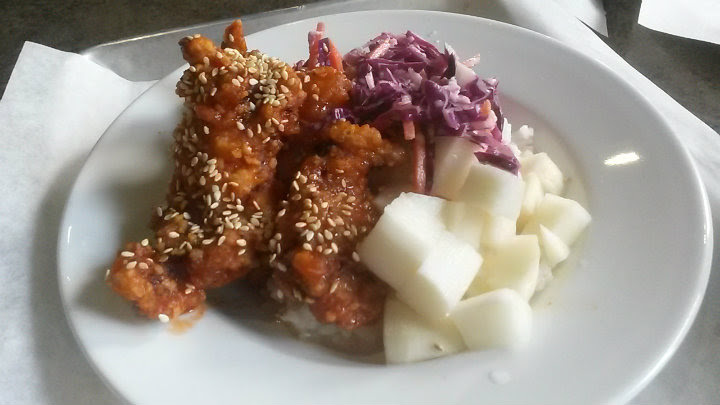 I enjoyed the cubed pickled radish and the house-made kimchi. The rice (which was under the slaw) looked a bit mushy on this go-around; even with other sauce from the chicken poured on it, I figure it shouldn't affect the texture in that way. We then ordered the Spicy Korean Fried Chicken ($9), again with the same sides. 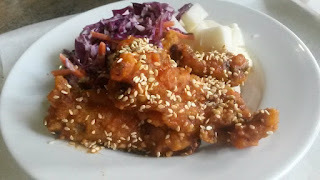 The sauce on the fried chicken pieces here tasted like a hybrid of wing sauce and gochujang (Korean red pepper paste). An interesting, but tasty result. Once again, virtually all dark meat from the pieces I had. The fried chicken I had was not crunchy. I was honestly hoping for crunch here, much like how people still get the crispiness on a good wet wing. I have had very crispy Asian versions of fried chicken in the past that I madly fell in love with. Since FOMO does a Southern fried chicken dish, I would certainly hope that one has the crispiness down pat. Maybe I just chose wrong on this go-around? 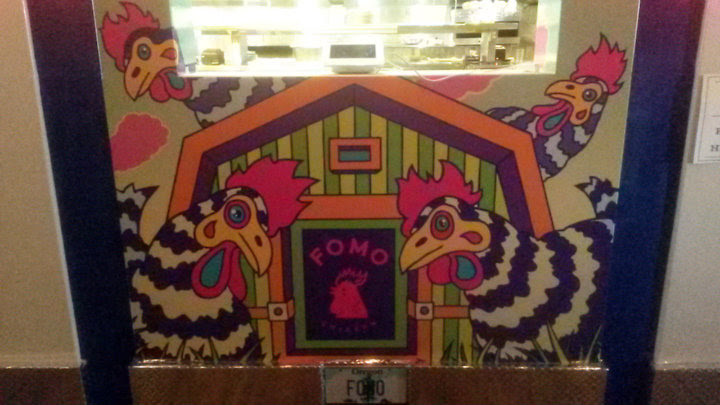 Their website does not mention FOMO's breading process, but does proudly state that they use locally sourced, organic chicken. The rice this time may have been a disappointment, but I'll simply assume it was a subpar batch.